I have been doing a little more parchment work trying to keep my hand in, so I don't lose all the skills I have learnt. 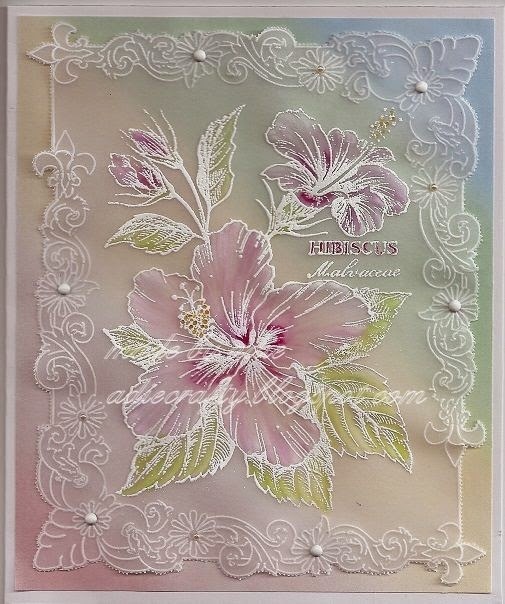 I have stamped the PSX Hibiscus stamp onto parchment heat embossed it with white embossing powder. I used the PCA TP3162E Easy Emboss Corners 2 template on the corners.I then coloured the image with Aquamarkers. Attached the parchment with some white brads to some printed rainbow paper added a few little pearls. Done.